Cohesive self-adhering elastic bandage made from a nonwoven fabric and elastic fibers disposed longitudinally. Designed for compression treatments. Provides support and restriction to muscle and joint injuries, as sprains and strains. 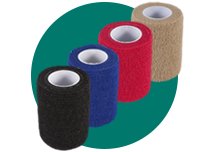 Suitable for securing wound dressings, particularly on joints, moving parts of the body and extremities. Ideal for immobilizing limbs for splints and casts. Provides secure fixation of medical devices; e.g. tubes, catheters, measuring devices, etc. Indicated for treatment of varicose veins and venous ulcers.